So, here I am again sharing my Singapore experience from a few months back. Actually, this is the very first part of it since my last one was on Legoland Malaysia. I hardly visit zoos. There is only one instance which I can recall that I visited a zoo – the Manila Zoo when I was in 2nd grade. There’s something about zoos that don’t interest me even though I love watching the National Geographic. That’s why I was pretty surprised when I actually wanted to see the Night Safari in Singapore. I look like a dweeb. Then again, I’m a geek. Close enough. 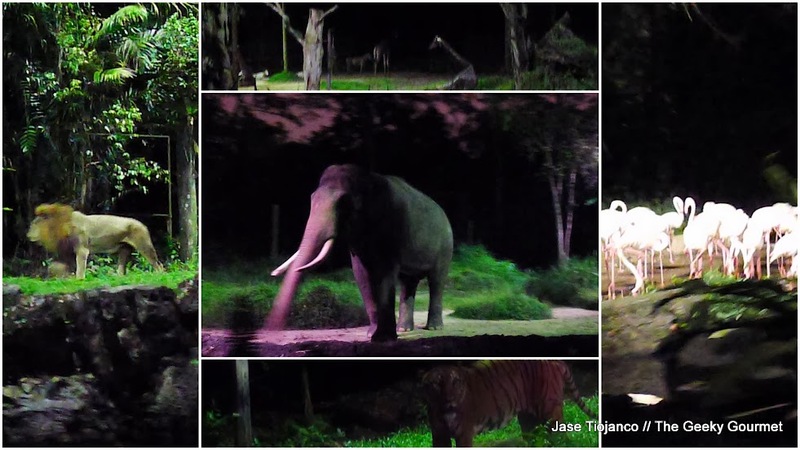 The Singapore Night Safari is the very first safari park for night (or nocturnal) animals. It opened in 1994 and today it welcomes more than a million visitors a year. This award-winning park has more than 2,500 animals housed in areas similar to their natural habitats. A ticket here costs 35 SGD for adults, which is roughly 1100 PHP. All set for my Night Safari adventure! The park has different attractions for both the young and the old. Their main attraction is the guided tram ride that takes one across 7 zones from around the world. There are also walking trails for the guest to explore. Quite a number of the animals are too little to clearly see from the tram ride and this is how you’ll see them. Lastly, they have special shows and performances to keep you entertained. There’s a fire dance-slash-stunts show called the Thumbuakar as well as the popular (and definitely a must-see) Creatures of the Night. When I arrived at the Night Safari, I was just in time for the owl pictorial. I headed to the activity area and lined up to have my photo taken. Good thing I went there early, the line for the owl became crazy a few minutes after I had my photo taken. The first attraction I went to was the Wallaby trail. The trail is inspired the Australian Outback and features nocturnal animals from the land down under. Entrance to the Wallaby Trail. The Wallaby Trail’s a good first activity at the Singapore Night Safari. The first part of the walk leads you to the Ranger Station that’s choc-full of information on the popular marsupials from Australia. You will see a taxidermised kangaroo and cassowary, as well as some of Australia’s flora and fauna. Aside from the wallabies, you will also see other animals from Australia. There’s an area for sugar gliders and bush-tailed possums. You will also pass through a cave wherein you will see creepy-crawlies of the dark. Moving on… As I have mentioned, the Night Safari has two special attractions. I went to see the Thumbuakar after walking the Wallaby Trail. The Thumbuakar Show features ‘pyro warriors’ who blow flames from their mouths while dancing with… What else — fire! Once the flame throwing and fire dancing was over, I rushed to the Creatures of the Night show (which gets filled pretty quickly). This was my favorite in the whole Night Safari experience. It’s a 20-minute show which features some of the Night Safari’s most popular animals. The show was hosted by a lively and upbeat guy in a safari costume. The show seems like it was catered for kids but it’s great fun for adults as well. It is very interactive, with many acts requiring audience participation. A huge part of the show was spent calling different nocturnal animals, some having special talents. Is this a civet? Haha. I couldn’t recall. At one point in the show, a python was pulled out from the audience area. I could just imagine how horrified the person sitting beneath is was. A member of the audience with the python wrapped around him. Hahaha. Scary. My favorite was the otter who can segregate trash. It swam across the small lake behind the stage, climbed, and started picking up the trash being thrown by the host. After the show, I rode the tram to see some of the bigger animals in the Night Safari. Sadly, most of my photos were either dark or blurry. Still, I managed to get some decent snaps. The tram ride was quite long. It was really amazing to see those animals just roaming around. There was a guide narrating about the animals in each habitat. I was pretty tired after the tram ride but I still went on to the other walking trails. I ended my Night Safari experience by window shopping in their souvenir store. It was almost 12 midnight when I decided to call it a ‘day’. After walking for almost 5 hours, I was exhausted. But it was worth it! I really enjoyed the Night Safari. The price might seem a bit high but you get more than what you pay for. One advice I could give is to put on some anti-mosquito lotion like Off before heading there. I had many mosquito bites especially after the tram ride.